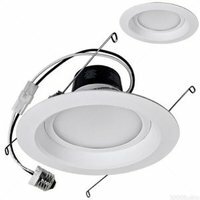 This recessed downlight kit is ideal for retrofit or new construction recessed downlight applications. Ideal for replacing dimmable 85W incandescent alternatives in 5" and 6" recessed cans. It has a smooth, uniform dimming from 100% - 0.5%. Easily installed and has integrated trim.